PEACE LIKE A RIVER : Yehudit Korn practices lymph drainage therapy, which she compares to cleaning rivers of harmful pollutants. # For years, local insurance agent Jim Weldon felt lethargic. Even after the most effortless tasks, he says he would walk around town feeling nearly exhausted. And despite proper nutritional intake, adequate exercise, and an active social life, Weldon just couldn't seem to shake his sluggishness. "I was not feeling 100 percent and didn't know why," he said. So he sought medical attention from a conventional doctor, who prescribed pills to the now 64-year-old. He began taking the medication as directed. He also increased his fitness and got more sleep, but still, nothing changed. It wasn't until he stumbled upon Yehudit Korn's lymph drainage therapy that he felt better. And the results, he said, were nearly immediate. "A little over an hour after the session, I was feeling much better," Weldon said. "And within 24 hours, I was feeling really chipper. It's a wonderful experience." Weldon, who now visits Korn on a quarterly basis, said that the medical care is like an internal oil change. "Before the treatment, I'm usually feeling listless," he said. "After, I'm almost a new person. It really cleans out my system and gets me firing." One of the lymphatic system's roles in the human body is to filter bacteria, toxins, and such out of circulation. When lymphatic tissues have been damaged, destroyed, or removed, normal circulation is affected--and so is the body's well-being. "Like the rivers in the Earth that can become polluted or stagnant and breed bacteria, the body also has rivers filled with lymph fluid that also accumulate toxins that stagnate the flows of the lymph fluids," Korn said. "People should have their lymph nodes drained on a regular basis so their immune system can thrive and stay healthy and free of harmful bacteria." Lymph drainage therapy is a treatment that involves kneading the body's muscles, but it goes beyond ordinary massage. Korn uses subtle maneuvers--light pressure and wavelike movements--that she says aid in the recirculation of the lymphatic flow. The established medical community commonly dismisses the benefits of this type of bodywork. Critics of the practice point to the somewhat vague use of the word "toxins," noting that a healthy body gets rid of what it needs to get rid of. Still, Korn believes lymphatic massage is complimentary to a person's well-being. "The work I'm doing is not alternative," Korn said. "The work I do compliments the medical community." Korn is a certified medical bodywork specialist who has treated patients with various injuries, pains, and chronic conditions for more than a decade on the Central Coast. She is experienced in an array of therapies, including aromatherapy, Shiatsu, Jin Shin acutouch, reflexology, and visceral manipulation. 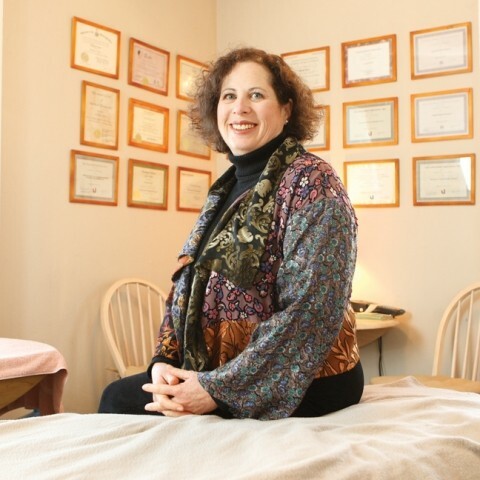 She proudly boasts certifications from the Esalen Institute, the Hirudaya Holistic Life Center, and the Alexander School of Natural Therapeutics. But it's the lymph drainage therapy that's been a staple of her work. "My passion began when I discovered working with the lymphatic system," Korn said. "I really enjoy working with healthy people who want to improve their immune system and stay healthy." Want to find out more about Yehudit Korn's techniques? Visit her Healing Springs office at 777 Pismo St. in San Luis Obispo or call her at 781-0111. Staff Writer Kai Beech also enjoys working with healthy people. Send comments to kbeech@newtimesslo.com.